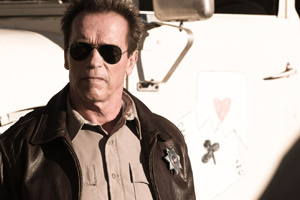 Arnold Schwarzenegger continues his big-screen comeback with The Last Stand, a zealously violent and gleefully preposterous explosion of dramatic cliches and gun violence. Korean director Kim Jee-woon certainly does his best to bring super-charged kick to a tired story about a small-town sheriff (Schwarzenegger) who faces off against an escaped Mexican drug czar (Eduardo Noriega). After out-foxing his FBI captors, Noriega’s Gabriel Cortez heads for the border. Along the way, he’s helped by a small army of brutal loyalists. Where FBI agents — led by Forest Whitaker — fail, Schwarzenegger’s Ray Owens is bound to succeed, hardly a spoiler in a movie that appropriates key plot points from every Western in which lawmen face impossible odds. What? You thought Arnold would come off as a chump? Arnold’s Sheriff Owens receives support from his deputies (Luis Guzman, Jamie Alexander and Zach Gilford). Johnny Knoxville provides what passes for comic relief as an oddball collector of exotic weapons, some of which figure in the movie’s final showdown. We know from the start that Cortez and Sheriff Ray will cross paths in a last-ditch effort to keep Cortez from crossing the border. The movie’s purposefully far-fetched approach finds Schwarzenegger playing things straight in a part that occasionally requires him to refer to the fact that he’s growing older. Not to worry. At 65, Arnold’s still capable of turning himself into a human assault weapon. When someone is blown away in this cartoonish bloodbath of a movie, they’re really blown away, blasted into oblivion amid flashing sprays of blood. Witness what happens to poor Harry Dean Stanton, who spends a hot minute on screen as a farmer who’s murdered by one of the drug czar’s henchmen (Peter Stormare). To up the ante, Cortez takes a female FBI agent (Genesis Rodriguez) hostage as he barrels toward the border in a sleek black sports car that’s capable of hitting speeds of 197 miles-per-hour. He thinks he’s invincible. Kim (The Good, The Bad, The Weird) doesn’t skimp on action or allow much time for soul searching. On at least one occasion, he’s able to strut his stuff. A set-piece built around a car chase in a cornfield qualifies as the movie’s imaginative high point. Although The Last Stand certainly isn’t meant to be taken seriously, it sometimes made me uneasy. How many more movies do we need in which artillery speaks a lot louder than any of the dialog? Fair to say, The Last Stand does its share of cheer-leading for weaponry and blood. Ray creaks a little after a fight — and so does The Last Stand, which (either wisely or foolishly (depending on how you look at it) tries to cover its paucity with Kim’s visual pyrotechnics. Oh well, you can’t say that the former governor of California isn’t trying to restore his box-office primacy. Early in the movie, we learn that Ray deserted Los Angeles crime-fighting for a quieter life in small-town Arizona. He’s had his fill of the big time. Unlike Ray, I don’t think that’s the direction Schwarzenegger wants to head.